In one of our range of air circulating or muffle furnaces. This is a thermal process to make the material more ductile and therefore more workable. It can also be used to 'remove' the hardness in an already hardened component. In ferrous materials we can give a subcritical anneal with no change to the microstructure by heating to between 540°c to 650°c, an intermediate anneal with the microstructure having some transformation to austenite by heating to between 650°c to 760°c and finally a full anneal with full austenite transformation by heating to between 815°c to 925°c. All heating cycles are followed by a slow cool, in air where the surface finish is not important as it will oxidize, or in a neutral atmosphere to prevent oxidization and decarburization. Non-ferrous materials are annealed in the same way and the material used dictates the temperature required. On some occasions the annealed condition can be improved by rapidly quenching in water. 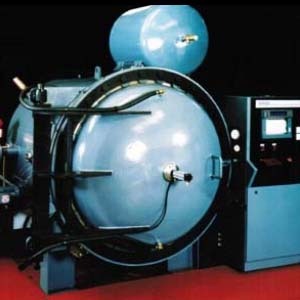 In our vacuum furnaces or air furnaces in an inert atmosphere. This is the same process but is performed in our vacuum furnaces or in an inert atmosphere furnaces. With the removal of oxygen there is no oxidation and the component remains bright.